A fantastic year finished with a spectacular performance at the National Championships in Iniscarra this weekend. 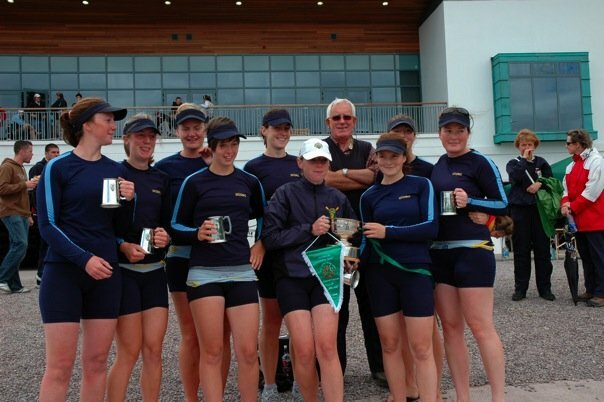 UCD brought home 7 National Championship titles; the biggest haul in several years and confirming the growing strength & ambitions of the club. 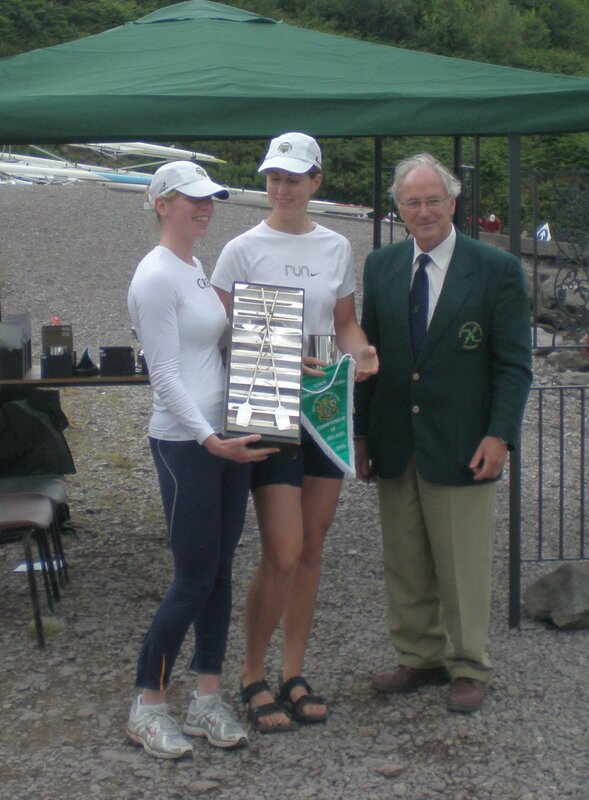 The first title was won on the Friday by the Women’s Senior 2x of Helen Walshe & Anne Claffey. UCD led the field from early on and finished 9 seconds clear of the second-placed Old Collegians crew of Siobhan Jacob & Becky Quinn. This was the seventh National Championship for Anne and the sixth for Helen and was their first competitive reunion in the combination since their novice year 8 years ago. The second title was taken by the Women’s Intermediate VIII of Fifi Monahan(stroke), Laura Gannon, Deirdre Keane, Emma Doyle, Naomi Fearon, Susan Harkin, Aisling Ryan, Emily Kearney(bow) & Michelle Claffey(cox). Returning from Henley, this strong crew had gained valuable racing experience and managed to hold off strong pushes by the University of Limerick to win by over a length. 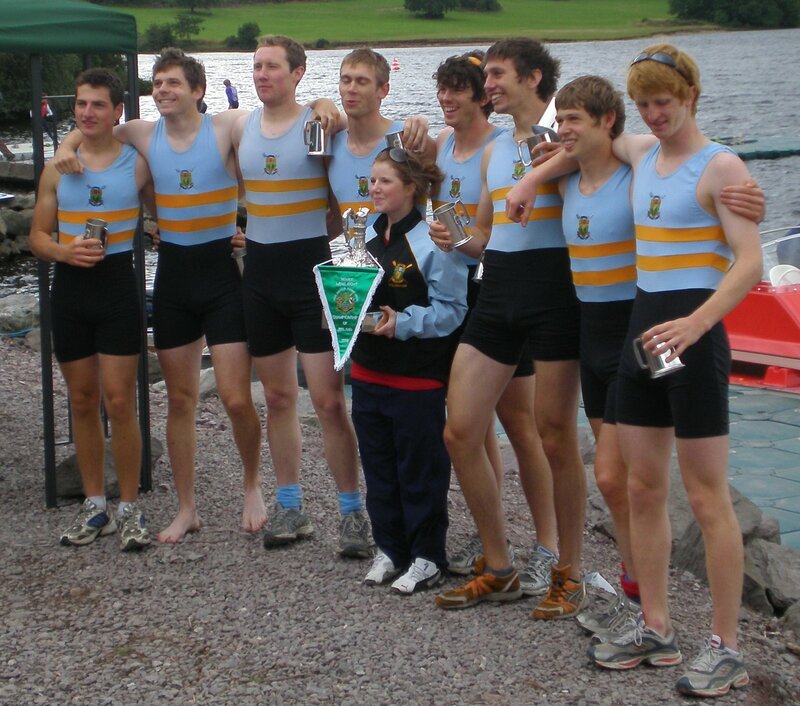 The Men’s Novice VIII was one of the most exciting races of the Championships. The crew.was a length down and in 3rd place for the first 1,000m behind Queen’s ‘A’ & Trinity – an unexpected position for the crew that won the University Championships by 6 lengths and making their supporters extremely nervous. In their 3rd 500m, they managed to move through Trinity and close the lead on Queen’s making for a spectacular final 500m passing the enclosure. Trinity were pushing back strongly and Queen’s were trying to hold on to their lead, now down to less than half a length. 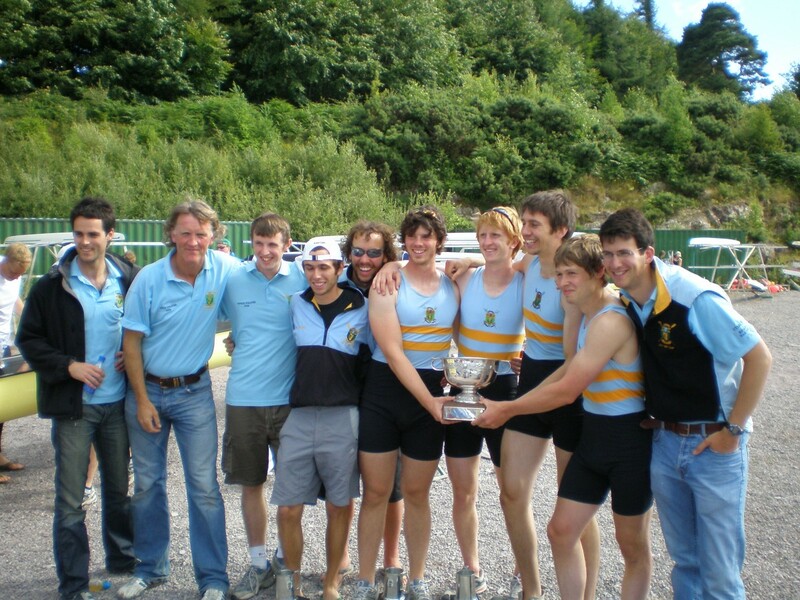 With the whole of UCD support screaming from the bank, the crew stepped on it and moved through Queen’s to win by just under a length. The winning crew was Richie Murray(stroke), Alan Curran, Dylan Finnerty, Peter Murphy, Joe Murphy, Darragh Coffey, Chris Barter, Philip Craven(bow) & Jennie Lynch(cox). 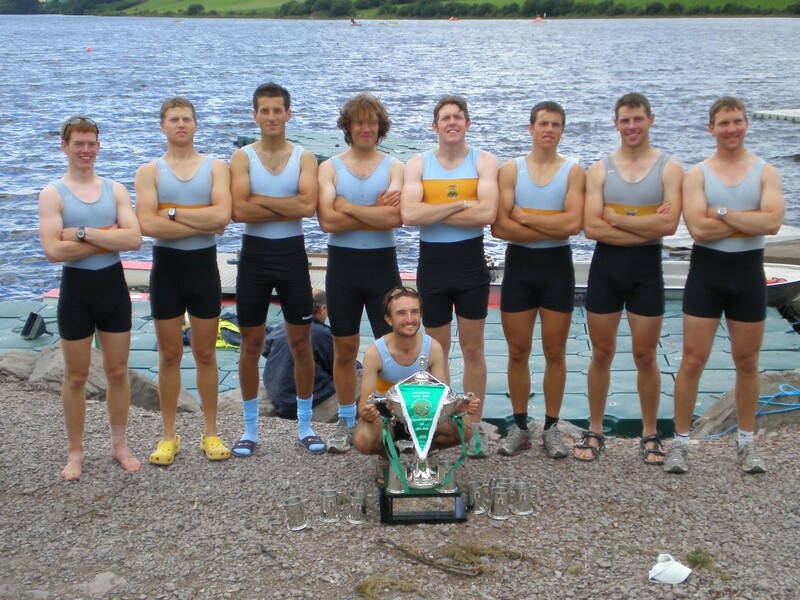 The Men’s Intermediate VIII brought home the fourth title for the club. The crew had had an eventful final month of the season with their stroke Anthony English getting injured soon after winning the Senior VIII at Metro Regatta and the 7 man Tom Doyle, picking up an illness on the UK training camp. This meant a reshuffle of positions and sides for the crew, missing out on a trip to Henley Royal Regatta and the Championship crew not fully decided until the week before. The crew was determined not to let these distractions affect them though and put in an intense final week of training. Facing Commercial RC, Belfast RC, Shandon BC, Cork BC & University of Limerick in the final, the crew went out determined to finish an amazing season with a high. Commercial had a very quick start and were coming into the 500m half a length up. UCD however held their discipline and kept to their own well-rehearsed race plan, never doubting that their technique would bring them through. From there on, UCD took the lead and with Commercial moved away from the rest of the field. Once in front, UCD were not going to let anyone take the Championship from them and held off strong pushes from Commercial for the remainder of the course to finish in 1st by just under a length. Their time of 5:51.1 was joint fastest of the day with Trinity’s time in winning the Senior VIII title. 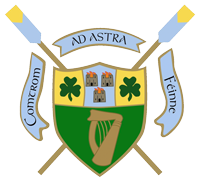 Trinity’s win has shown that it is possible for University crews to win over ‘super-composite’ crews and this year’s Intermediate crew is already looking forward to next year’s Championships where they will be determined to win UCD’s first Senior VIII title since 1973. 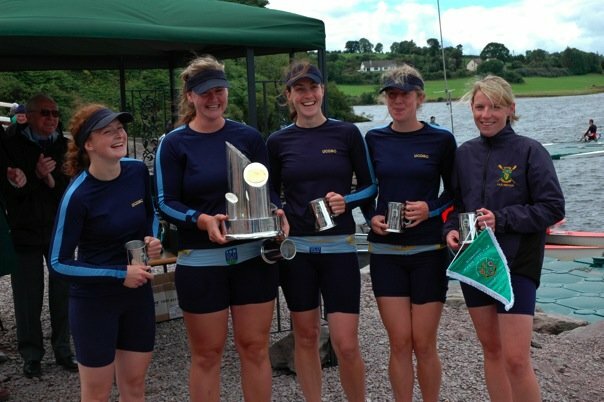 The fifth title was won by the Women’s Intermediate 4+ of Fifi Monahan, Laura Gannon, Deirdre Keane, Susan Harkin & Michelle Claffey(cox). After the start UCD were level with Skibbereen, but an impressive push saw them take the lead by the 500m mark. They put in a number of very effective pushes, advancing their lead to a commanding 5 seconds by the time they passed the finish line ahead of Skibbereen, University of Limerick, Colaiste Iognaid, Queen’s & St. Michael’s. 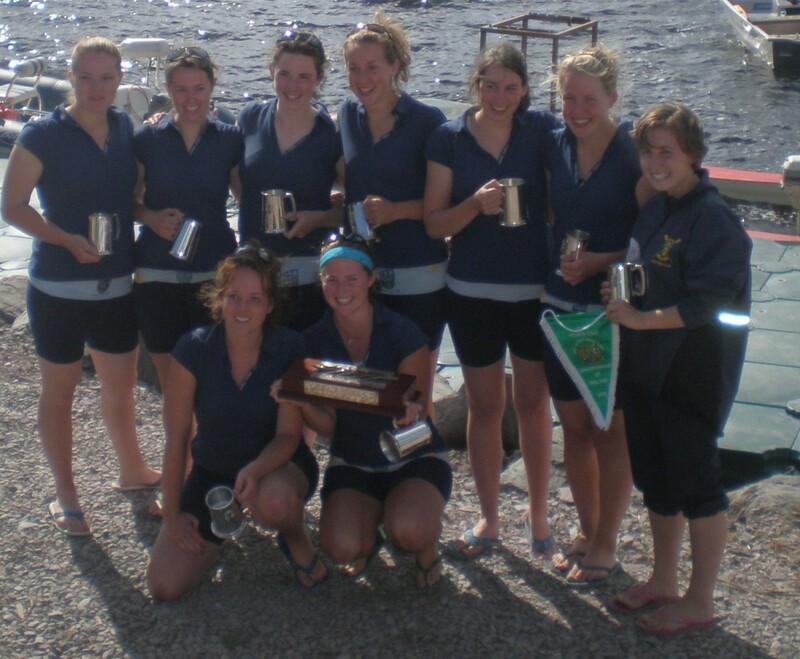 The Women’s Novice VIII was the sixth win for the college. In another strong performance, UCD Ladies finished 7 seconds ahead of their rivals from Trinity. Their first 1,000m was eventful with the lead changing several times between the two crews. However from the 1,000m mark on, the crew of Bronwyn Lait(stroke), Laura Reid, Emer NicAoidh, Roisin Harkin, Hannah Brady, Sarah Murphy, Clare Robinson, Neva Noone(bow) & Karen Concannon(cox) began to move away from Trinity and finished comfortably ahead. The last race of the day was the final of the Men’s Novice 4+. Freely admitting that they are not “a paddling 4+”, nevertheless UCD had been unbeaten all season in this combination all season, both in Ireland and at Reading & Marlow regattas, and were looking to keep this unblemished record. Facing up against University of Limerick, UCC, Trinity, Lee & Garda Boat Clubs in the final, the 4+ led from the start and kept on moving. Passing the enclosure, the crew looked very strong and had a comfortable lead, crossing the finish line 12 seconds ahead of University of Limerick. This brought an end to both a fantastic Championships and an amazing season for the club. Seven titles, with three each at both Novice & Intermediate level bodes well for strong Intermediate & Senior squads next season. None of this success would have been possible without the support and dedication of the club’s coaches. For the Inter Men; Colm Daly & Conor Walshe, for the Novice Men; Ciaran Laird, Brian Barter, Campbell Gradon & Alex Hatwell, for the Women; Tom Sullivan & Eoin Craven. But most especially for Pat Gannon, inexhaustible, enthusiastic & with just that little bit of crazy – “Sure the only cure for being tired is more weights!” . The club would have been absolutely lost without all of you and we hope to see you back next year.